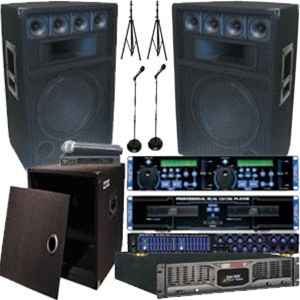 Karaoke / DJ System - Complete System - 2100 Watts! This complete Karaoke / DJ system packs a punch with a 2100W amplifier and 3-way speakers. Feel the music with tight, punchy lows and crisp highs. 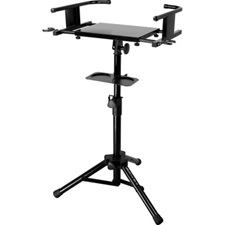 It is perfect for Mobile DJ's, small clubs & bars. Comes with two high quality wireless microphones so two people can sing at that same time. 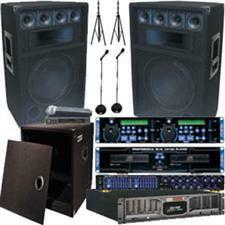 Includes a Professional Dual CD/CD+G player and Microphone Mixer, digital Echo, Graphics and Parametric Equalizer. It doesn't get any better than this! The DA-1055 PRO has the latest features that both the professional and the home karaoke enthusiast demands. Six microphone inputs with three volume controls allow up to six people to sing at the same time. The professional digital echo with digital delay and repeat controls helps the singer sound like a pro! The dual seven band stereo equalizer allows for the precise room tuning of the music. The three band parametric equalizer for the microphones feature sweep mid-range control to lift particular characteristics of the vocal or suppress for feedback elimination. The VocoPro DA-1055 PRO is your ultimate choice for great karaoke entertainment!